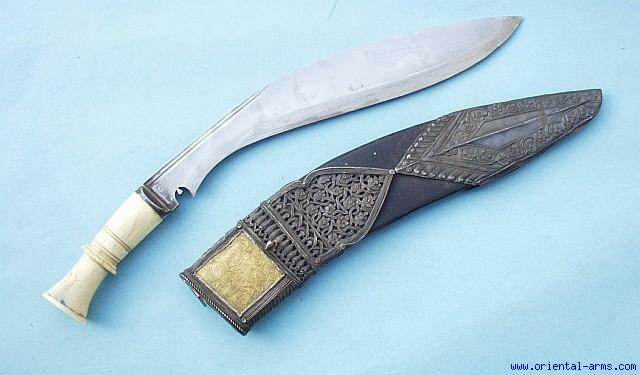 Kothimora, the Khukuri of the rich man are the daggers carried by nobilities and persons of high status. Like the one here they were weapons of high quality and richly decorated: The 12 inches swollen blade is forged of good steel. The handle is carved bone and the bolster is steel. Wood scabbard covered with the original black leather and mounted with big silver locket and chape, highly decorated by piercing and chasing. A gold foil plaque is set on the locket. Total length 16 � inches. The blade curvature, the fullers and the steel bolster all indicate a mid to late 19 C. item. Good condition. The compartment for the additional knives is missing and the leather is lightly worn.